My husband is big into books. They are his most prized possessions. What do you want for your birthday? a book, what do you want for Christmas? a book, for father's day? a book. You get the gist. He has his own Amazon wish list filled with pages and pages of the books he wants. Books are very important around here. He spends a lot of time organizing and reorganizing them. He divides them by category, then by author. 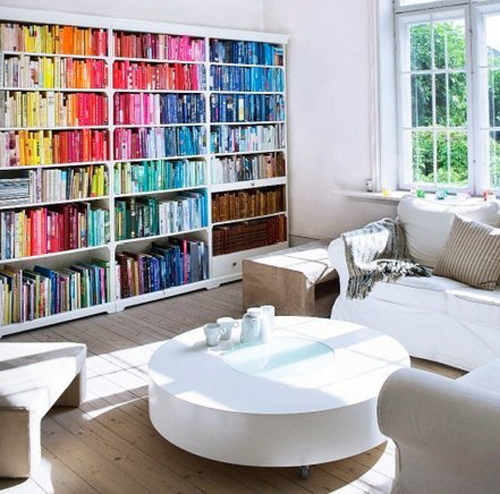 So whenever I see this rainbow trend of bookcase styling- I go crazy. I don't get it. How would you go about finding what you want? I don't think anyone would remember the color of the spine.....So... impractical styling, yes? pretty? I don't even think so. Don't buy books just to decorate! Buy books with a purpose- read them!! agree? I think the same, but in a par. I mean I think that is not practical at all, but on the oher hand it looks so nice to me! anyway, I prefer to have them organizes by category. The other day someone was telling a story about visiting an LA mansion where there was not even one single book. Books are a necessity. So i think they do become part of overall decoration. This is probably over the top, but it still looks cool! I worked in a book store, and by the time I left (only a year) I could visually remember some books by their spines. Maybe it's just be, but I think I could navigate this well!!! Thank you, thank you very much for the n.p. I' ll continue reading your blog!! Very interesting!!!!! I admit, I have organized my books this way ;) Now they're a little bit organized by color but more so just artfully displayed. Is it weird that I think part of the fun is looking for the book I want? I have only about 50 displayed, however, I think that makes a difference! Hmmm. 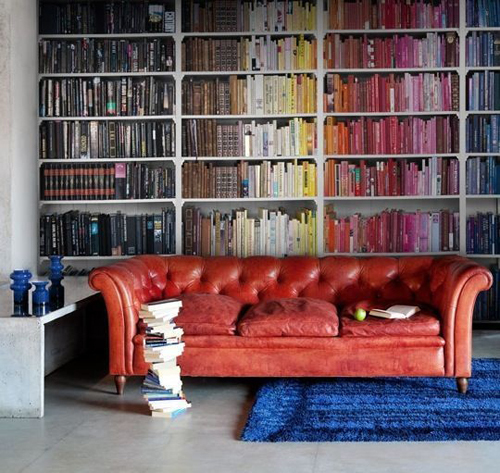 So agree that books should be bought for reading not decorating. 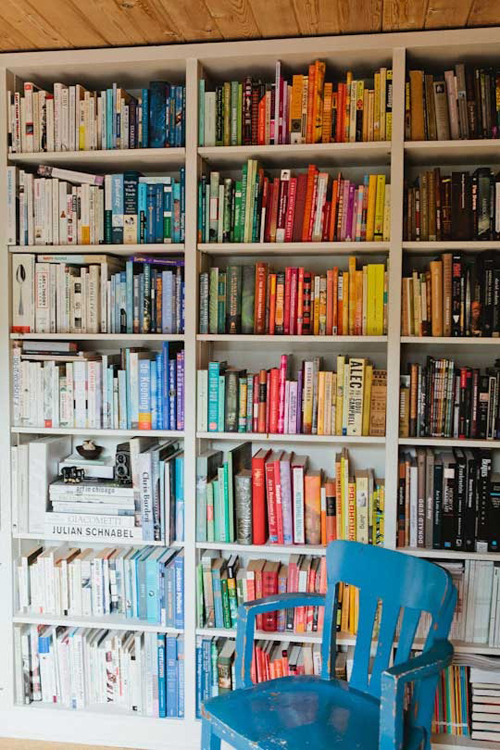 But I can see some purposeful color coordination happening if say you organize books by genre and then wrap the jacket covers in a specific color, that way you'll know all your self help books are in blue, and your anger management books are in red.